Find out how to get Postcards and where to mail them in Kingdom Hearts 3. As you play Kingdom Hearts 3 you’ll earn special Postcards. After earning them, you may find yourself wondering where to mail them off. To earn Postcards in Kingdom Hearts 3, you’ll need to purchase items from the Moogle Shops located in each of the different in-game worlds. As you spend Munny on items, you’ll receive Postcards and a prompt to mail them off to receive rewards. Wondering where to mail your Postcards? We’ve got you covered! Below, we’ve put together a quick guide with information on where to mail Postcards in Kingdom Hearts 3. 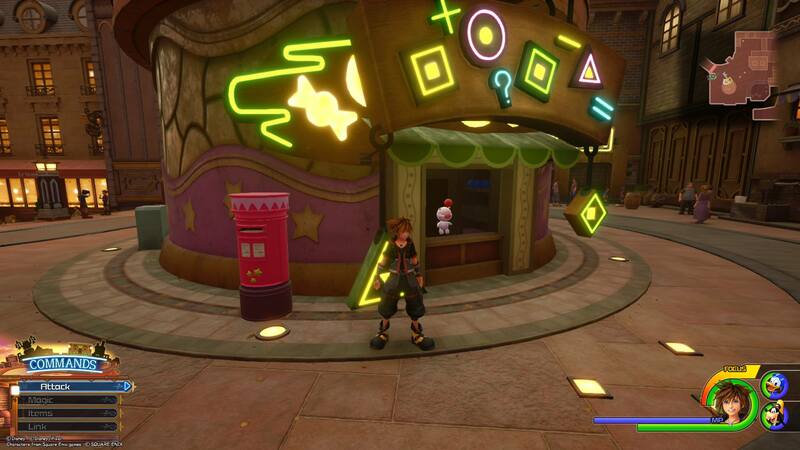 Interact with the red mailbox to the left of the Moogle Shop in Twilight Town to mail your Postcards in Kingdom Hearts 3. To earn Postcards, you’ll need to visit and purchase items from the Moogle Shops located throughout the Kingdom Hearts 3 universe. Upon earning a Postcard, you’ll need to return to Twilight Town in order to mail it. If you’re exploring a world outside of Twilight Town, simply locate the nearest save point, then open the save menu and select the World Map. From the World Map, highlight and select Twilight Town to spawn there. Inside Twilight Town, head over to the Moogle Shop in the center plaza. To the left of this Moogle Shop, look for a circular red mailbox. Approach the mailbox and interact with it to bring up the option to send a Postcard. 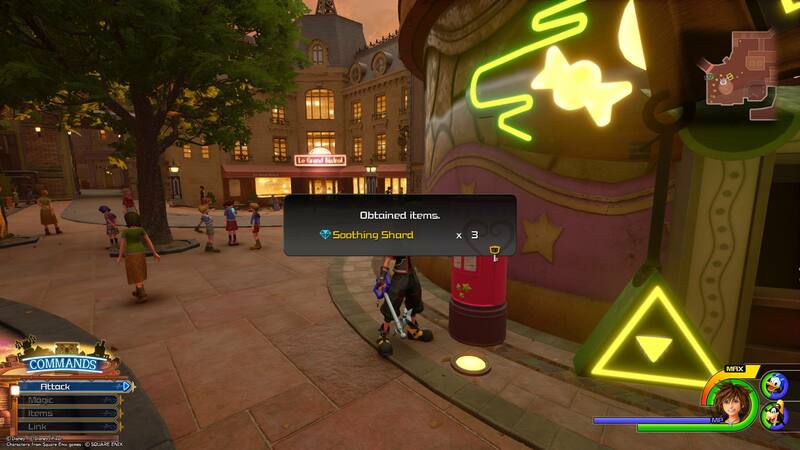 You'll receive rewards for mailing Postcards in Kingdom Hearts 3. After you send a Postcard, you’ll receive a random reward. For example, after we mailed our first Postcard we received 3 Soothing Shards. If you have more than one Postcard in your inventory, you can continue to interact with the mailbox in Twilight Town and send your Postcards to earn rewards. How many Postcards have you earned in Kingdom Hearts 3? What was the best reward you received after mailing them off in Twilight Town? Let us know down in the comments below! For more on Kingdom Hearts 3, be sure to check out some of our previous guides including the complete world unlock order in Kingdom Hearts 3, all keyblades in Kingdom Hearts 3, and how to skip and rewatch cutscenes in Kingdom Hearts 3.